In June 2018, the Campaign for Southern Equality (CSE) launched its second iteration of the Southern Equality Fund Advisory Council, now known as the Resource Mobilization Team. 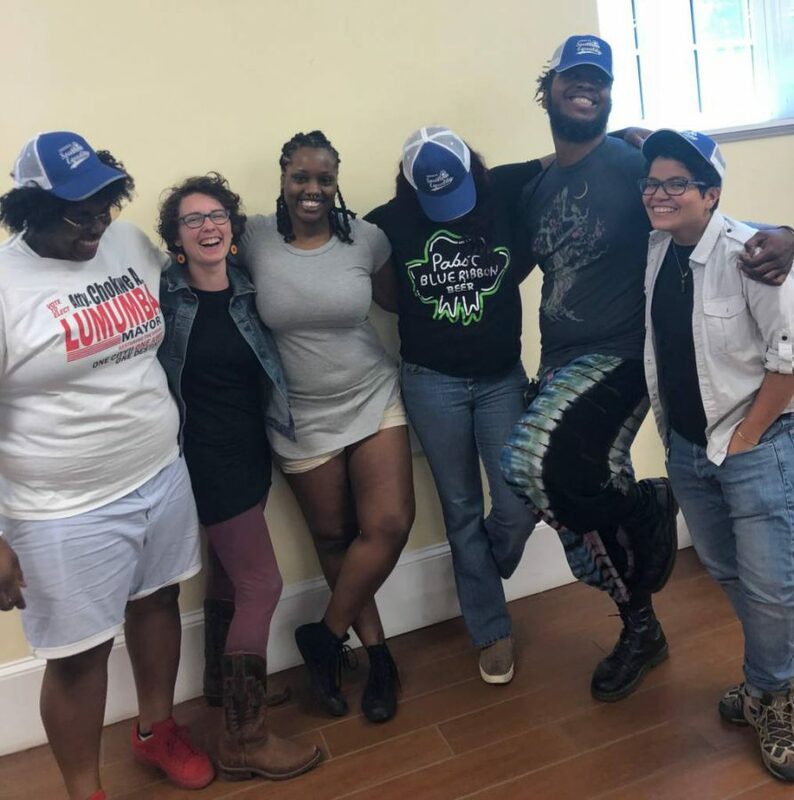 As part of our Southern Equality Fund, the Resource Mobilizing Team(RMT) works to increase capacity of Southern LGBTQ grassroots leaders by connecting them with funding, by providing opportunities for training and support and by expanding their organizing and social networks. In addition, the RMT participates in a peer learning curriculum that focuses on building a shared analysis and developing strategies for mobilizing resources in the South. The 2018 Resource Mobilization Team is comprised of four amazing organizers: Natt Offiah from Jackson, MS, Kayla Gore from Memphis, TN, Demi Hickman from Charleston, SC, and Yaz Nuñez from Durham, NC. We are excited to partner with these leaders on building a pipeline of funding and other resources to LGBTQ grassroots organizers across the South. Learn more about them below! And click here to learn more about the Southern Equality Fund! RMT and CSE team members met in Asheville in June for an orientation and strategy session. Kayla Gore is a community mobilizer and activist for social justice. She is the Trans Services specialist at OUTMempihis where she work with the LGBTQ+ community. Kayla is a State Certified HIV tester and Sexual Health Counselor. When she’s not advocating the just treatment of Trans/GNC people ate OUTMemhis she volunteers for various CAB’s (community advisory boards) such as Memphis Community Bail Fund in partnership with Just City, Mid-South Peace and Justice Center, My Sistah’s House a local house for trans/gnc adults who have recently been released from incarceration/experiencing homelessness or anti-trans violence, Tri-State Black Pride Board Chair, St. Jude HPTN Advisory Board, Lebonheur CHIP-CAB. Kayla has also worked on campaigns with Healthy and Free TN, NMAC, Gilead Pharma, Friends For Life, The Red Door Foundation, among many other organizations. In her spare time she enjoys doing absolutely nothing but listening to the sounds of life in her backyard with her two friendly pitt bulls.